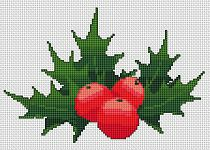 Holly Jolly Christmas cross stitch pattern designed for 14 ct red fabric.A richly decorated Christmas tree in anticipation of the Christmas night.For other fabrics stitch the background using 666 DMC threat. An easy to do Christmas card or bookmark with red and white hearts,two Christmas trees and the text:"Merry Christmas". The Christmas season is here! I wish you a Merry Christmas! Beautiful Christmas card designed for dark blue fabric depicting a red candle,yellow decoration,stars and the text:"Merry Christmas". 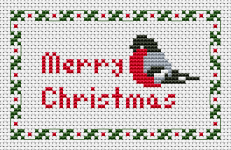 This card is designed for Christmas red Aida 14 ct and depicts Christmas tree, Santa hat and the text:"JOY"
It's Christmas time again .This little holly bird will bring you great joy and happiness. Santa Claus decoration with lot of snow, trees and the text:Xmas. Enjoy this cute snowman waiting for Christmas and stitch up as an ornament or a greeting card for someone. Christmas gifts shopping with smiling Santa designed for 14 count green fabric. Cute snowman with a top hat and scarf and the text:Merry Xmas. The Christian meaning:The prickly leaves represent the crown of thorns that Jesus wore when he was crucified, the berries - the drops of blood that were shed by Jesus because of the thorns.